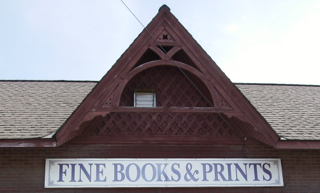 As befits a region acquainted with Susanna Moodie, Catharine Parr Traill, Robertson Davies, and Margaret Laurence, Peterborough and the nearby villages of Lakefield and Cavan offer the book lover a rich variety of rare, collectible and used books, skilled bookbinding, book repair, and paper conservation services. You will find used bookshops lining a single block of Peterborough's Water Street-- it's not quite 'book row' but it's headed in that direction. One block west and several south on George Street you'll find books for sale at the Antiques Shop, Jokinen Books, and Knotanew Books. A few kilometers up the road in Lakefield you will find antiquarian books and pictures at the handsomely renovated railway station. 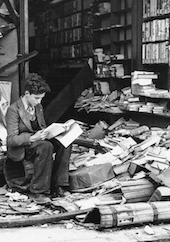 For the book hunter, there's plenty of game. 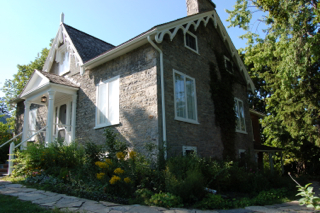 Peterborough is less than two hours from Metro Toronto via Highways 401 and 115 and about three hours from Ottawa by way of Highway 7 in good weather. Each year, at the beginning of Summer, just in time for flowery skirts and straw hats, a weekend is given over to the Lakefield Literary Festival. Conceived as a celebration of the life and works of Margaret Laurence, long time resident in the village, the Festival now has become a popular destination for ‘book lovers from across Canada and the United States’ who have discovered a ‘unique literary venue’ celebrating the work of traditional and modern writers alike. Details are to be found on the Festival’s web site lakefieldliteraryfestival.com. Most Mondays and Fridays at 3:00 PM a friendly, motley group of Peterborough's book obsessed people gathers for coffee at Dreams of Beans, 138 Hunter West, between Water and George Streets. You are welcome to stop and join us. We are easy to spot. We're almost always the oldest customers in the place. 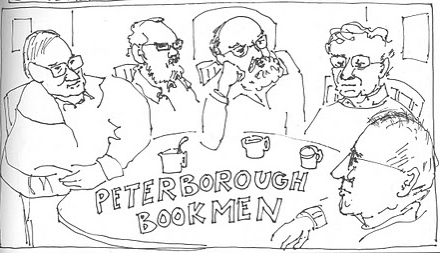 Here is a sketch of these worthies by our favourite artist, Christopher Lea Dunning of Ottawa (used with permission). 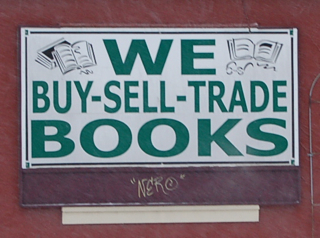 Trillium Antiquarian Books (1285 Albertus Avenue, Peterborough, K9J 6A4). Antiquarian books, country life, natural history, Canadiana. 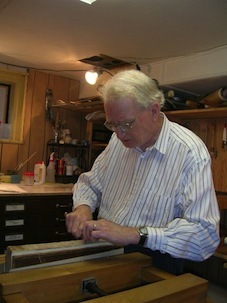 William Van Nest (IOBA). trilliumbooks@sympatico.ca www.trilliumbooks.ca 705-749-0461 by appointment.